Marshawn Lynch shakes off tackles as he forces himself into the end zone. 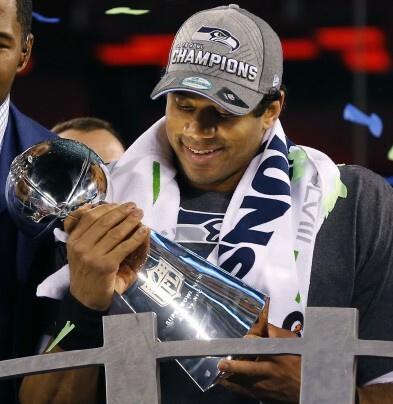 Russel Wilson holds up the Lombardi Trophy after the blowout win. 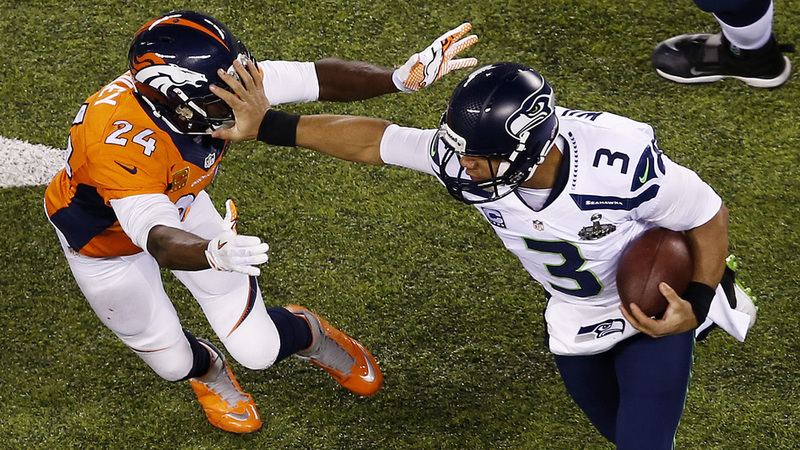 Russel Wilson stiff arms cornerback Champ Bailey as he runs for the first down. Demaryius Thomas makes an outstanding touchdown catch in the fourth quarter. 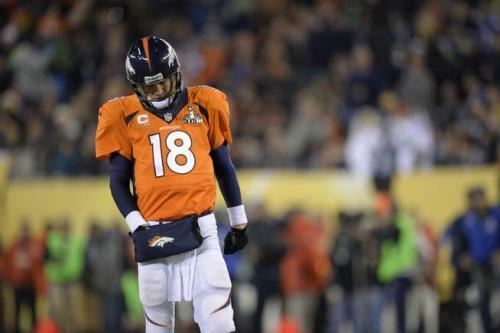 Broncos, Peyton Manning Manning walks off the field disappointing as his team is losing terribly. Superbowl XVIII, Broncos vs. Seahawks, was an embarrassing game for the Broncos. The Seahawks were on top of their game last Sunday as they completely blew out the Broncos. The Seahawks had a dominate defense and a superb offense. Ever since the first play of the game the Broncos offense could not get anything going for them. Peyton Manning Threw two early interceptions and the Seahawks recovered two fumbles. For the Broncos, who pride themselves on not turning the ball over, these four turnovers were crucial. The Seahawks converted there opportunities and the Broncos defense struggled to make plays. They were going into tackles very soft and the Seahawks only used that to their advantage. Seahawks receiver, Jermaine Kearse, spun off of four Broncos defenders and made it easily into the end zone. Receiver Doug Baldwin, also took advantage of the Broncos nonexistent tackling when he ducked under the arm of a Broncos defender and ran to the touchdown. It took until the fourth quarter for the Broncos to get points on the board. 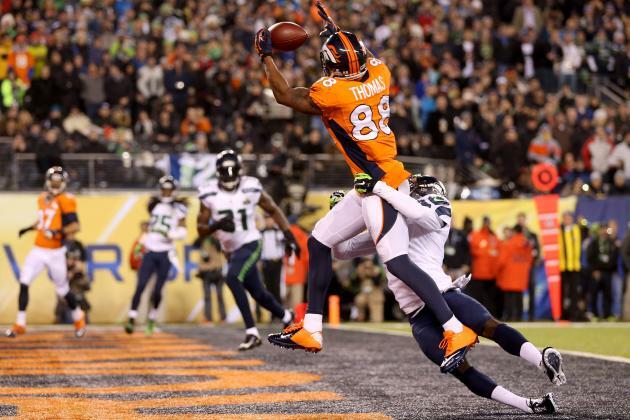 Demaryius Thomas had a leaping touchdown catch to give the Broncos a glimmer of hope. That hope was taken away as the Seahawks scored on the next drive. The final score of Superbowl XVIII was 43-8. The Broncos got Blowout of the water. 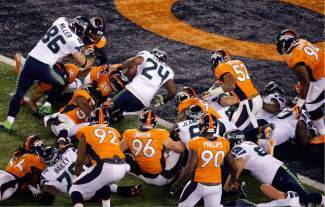 As the Superbowl is the most viewed game on television, the Broncos must have been embarrassed after a game like that. It was a complete team effort by the Seahawks but linebacker Malcolm Smith received The MVP award. He had nine tackles, recovered a fumble and had an interception that he ran to the end zone that earned him the MVP award. Congratulations Seahawks. What did you think of Superbowl XVIII? I was disappointed. I feel like the Superbowl should always be the best game of the season. Also, since I didn’t really care for either team I just wanted it to be entertaining. It was just a pretty boring and sad game from the beginning.